Rubber floor mat is anti-static, chemical resistant & welding safe. Midnight swirl design blends in with all environments. 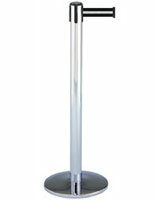 Anti-fatigue mat keeps worker morale & productivity up. 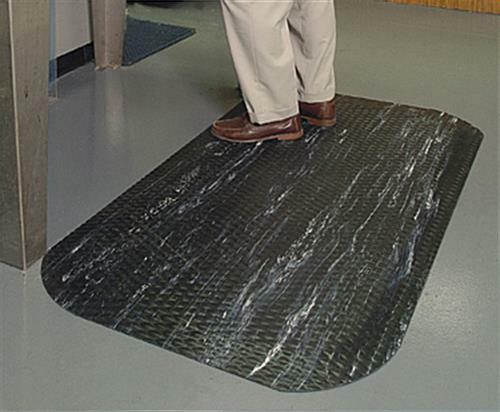 A rubber floor mat, also known as an anti-fatigue mat and a commercial mat, is normally used in shipping lines, assembly lines, and other work stations. 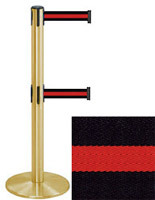 A rubber floor mat helps to lessen back and leg pain with their anti-fatigue capabilities. 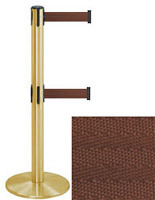 These mats are perfect for areas where workers stand while doing their job. 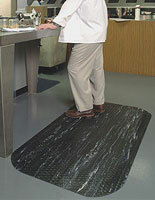 An anti-fatigue mat, rubber floor mat has beveled sides and curved corners. 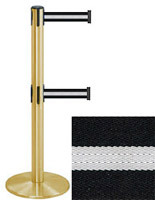 This helps to transition from floor to mat and prevent tripping in the workplace. A rubber floor mat is perfect for dry work areas, and is anti-static, chemical resistant, and welding safe to be used in many different environments. 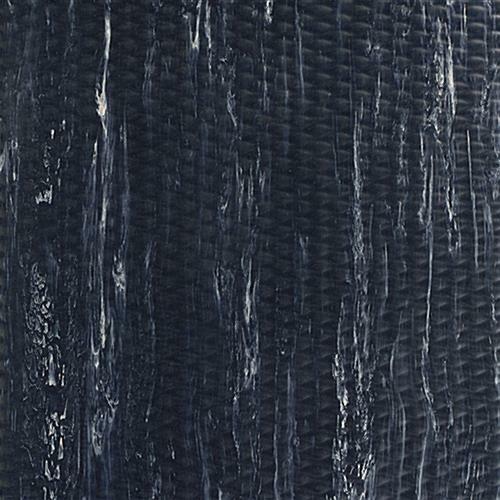 This rubber floor mat is made of textured nitrile rubber with a PVC cushion that has been permanently bonded together to prevent delamination. This rubber remains flexible for the entire life of the mat, and will not crack or curl with use. An anti-fatigue mat, rubber floor mat has a midnight swirl design with an embossed diamond pattern that easily blends in with any environment. This thick rubber floor mat helps to keep worker morale up as well as productivity. 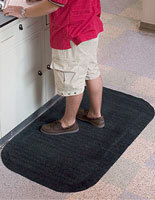 This rubber floor mat has been certified slip resistant by the National Floor Safety Institute. 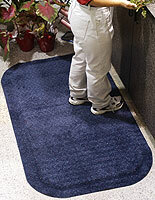 Use a rubber floor mat at your business today to increase safety as well as comfort! 18.0" x 0.875" x 36.0"